As a youth, Future World was filled with plenty of “how do they do that?” moments, but no one pavilion featured more of these wide-eyed moments as The Living Seas. It wasn’t that I didn’t believe these things could be done, although I’ll admit the Hydrolators confounded me for years, it was that I simply wanted to know how, precisely, they had pulled off amazing feats or how a person navigated through the Lock-Out Chamber. I would watch for hours, okay possibly not hours, but as long as my parental units would allow, watching divers swim up or down the chamber, conduct observations and feedings, and interact with the creatures of the tanks. It’s a wonder I never took up scuba diving or animal sciences in school, based solely upon my fascination with The Living Seas. More often than not, while watching the divers swim about in all directions, my mind would wander to what it must be like to view the world from the other side of the glass. For all of you out there who daydreamed about the same type of excursion, today’s glimpse into yesterday is for you! 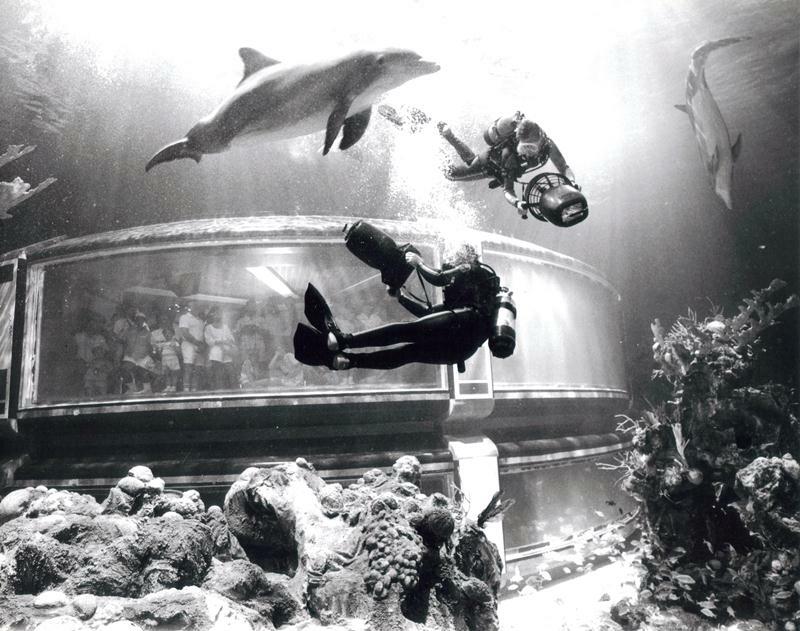 From inside The Living Seas dolphin tank in 1986, with love.